Synopsis : Accessibility extensions for Google Chrome browser aimed at helping persons with disabilities surf the Internet..
Google recently released two new extensions for its Chrome browser, both aimed at helping persons with disabilities better interact with the Web. Google Chrome is a freeware web browser developed by Google. The browser was first publicly released for Microsoft Windows (XP and later versions) on September 2, 2008 in 43 languages, officially a beta version. Google releases the majority of Chrome's source code as an open-source project Chromium. Google's first extension,Animation Policy for Google Chrome allows you to adjust just how most animated images will work in your browser. Make animations run only once. Works on all animated image formats and animated SVG. It will stop auto playing or loop playing animations on the web but don't worry it won't stop playing video on web. It stops only animation extensions, which are annoying a lot these days. The extension provides you with controls to run animations only once or not at all. It is compatible with popular image animation formats but not video animations. Color Enhancer for Google Chrome is designed for people who are color blind. The extension adds an icon to Google Chrome's address bar that reveals the options when you click on it. The second extension Color Enhancer for Google Chrome is designed for people who are color blind. 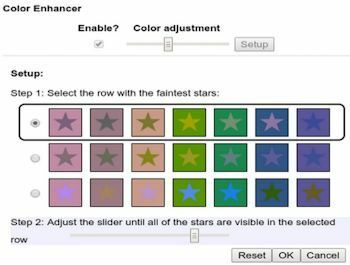 A customizable color filter applied to web-pages to improve color perception, for people who are partially color-blind. It better distinguish between the shades of colors so that people can better surf the web. Once you install this extension you can adjust the color temperature. During the setup process you're asked to pick the row of stars in a grid of stars look the faintest.